Renovation of the Bernard Family Hall of North American Mammals, Part I: What is a habitat diorama? In 2011-12, the American Museum of Natural History undertook an ambitious program of renovation to the 45 habitat dioramas in the Bernard Family Hall of North American Mammals. It was important that the unique features of each diorama be preserved throughout the renovation project, which played a role in deciding what kind of materials could be used for recoloring the faded taxidermy. This post summarizes how the dioramas were constructed – full details on the creation and significance of the Museum’s dioramas are beautifully illustrated in Stephen Quinn’s, Windows on Nature: The Great Habitat Dioramas of the American Museum of Natural History. Some of the earliest collections at the Museum were taxidermy, and the evolution of the diorama was a natural development in the tradition of using art to teach science. Within the museum, dioramas were created to promote the awareness of wildlife and so-called ‘primitive cultures’ as finite. They were also used to stir concern for the populations and habitats that were threatened by unregulated development and hunting. Fusing art and science, these habitat dioramas depict specific locations and exhibit anatomically correct mounted specimens in their natural habitat. 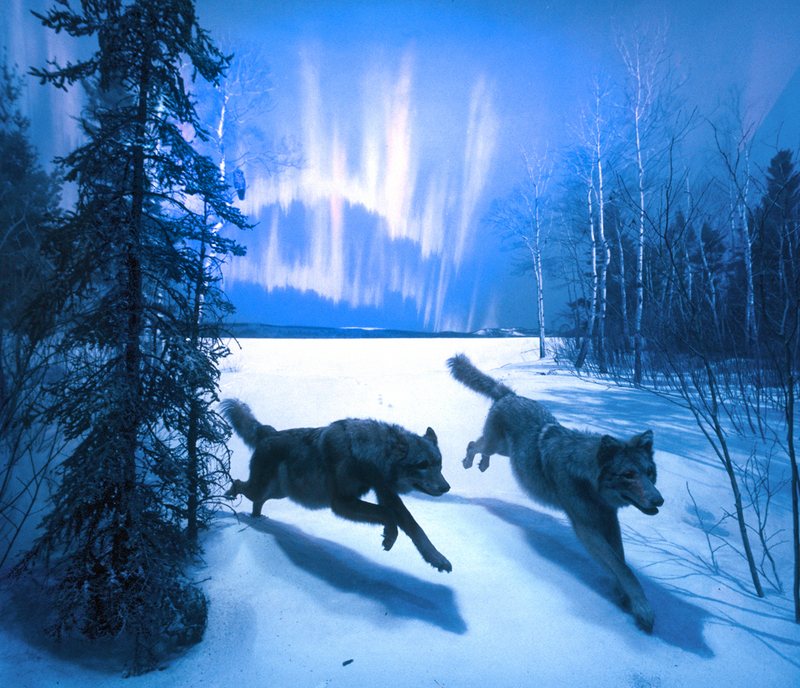 The original creation of the dioramas was a group effort, combining the skills of artists and scientists to illustrate the complex relationships between animals and their environment. Along with the Museum’s curators, they conducted extensive research, visiting each site to draw reference sketches, take photographs, and collect specimens for exhibit. Once back at the museum, every detail of the scene was painstakingly recreated. Careful positioning of specific lighting combinations illuminated the background paintings to create a particular season and time of day in the depicted location, with naturally posed taxidermy among site-specific plants and foreground materials. The dioramas at the American Museum of Natural History are the ultimate mixed-media artifact. They are made of three main elements: a background painting, foreground materials, and mounted taxidermy specimens. The partial dome-shaped enclosure is created using vertical angle-iron beams and heavy wire mesh. This framework supports layers of plaster, onto which the canvas background painting is attached using a white lead and oil mixture as adhesive. Access to the dioramas is difficult and can only be achieved by removing the front panes of glass or, in some cases, is attained by narrow ladders on the interior extending from the light box to the diorama floor. The background paintings in the habitat dioramas were examples of the highest form of wildlife artistry in their day, and many consider those in the Bernard Family Hall of North American Mammals to be the most accomplished of their kind. The curved background painting is essential to the overall illusion of space, distance and environment. It draws on Renaissance techniques such as under-painting, plotting perspective and transferring images with grids. Painters of note included James Perry Wilson, Frances Lee Jaques and Charles S. Chapman. 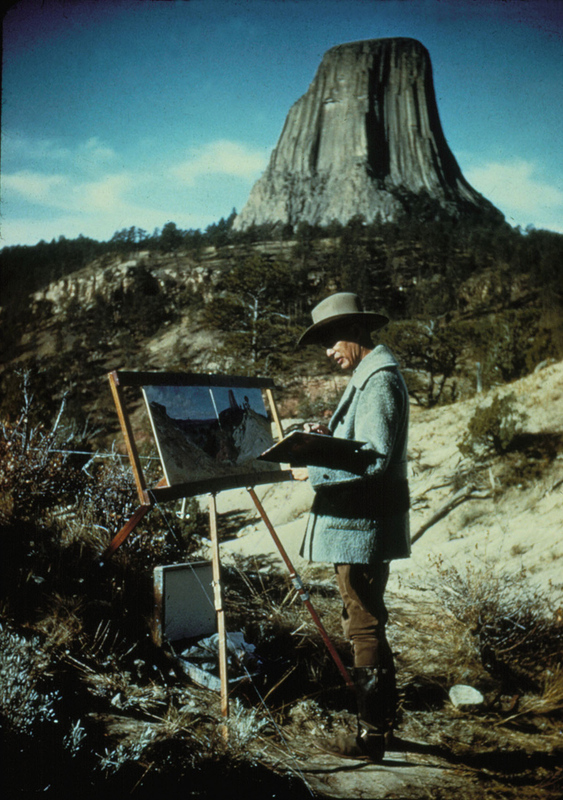 Wilson described his diorama work as “art to conceal art’, in other words, art intended to imitate nature so closely that the artist’s role is not visible (Quinn, 2006). 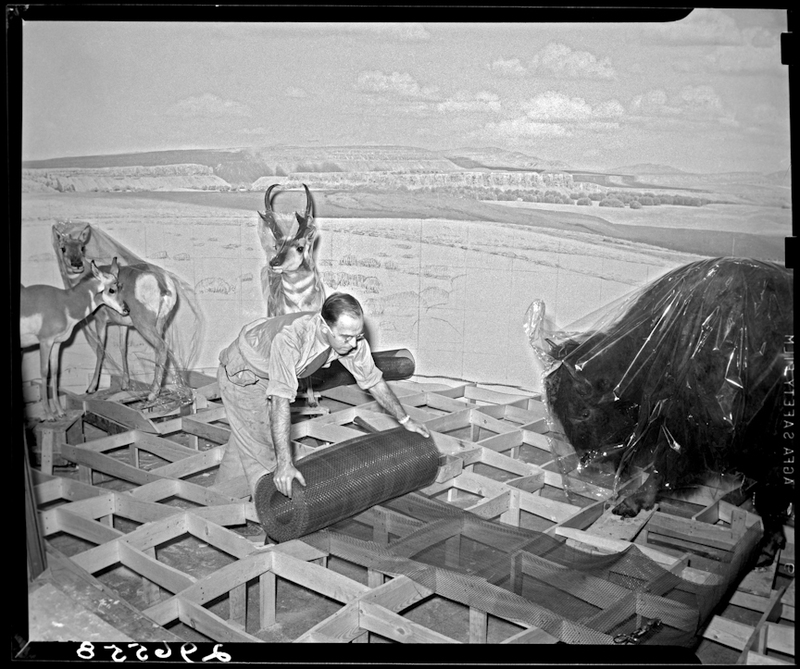 The floor of the diorama was built up to the needed height with an underlying structure of wooden beams, over which wire screening was formed to create the desired topography. Features of the landscape were constructed over the wire screening with a mixture composed of plaster, dextrin, whiting, and asbestos fibers. Plant materials were generally made from painted cotton or paper, sometimes flocked or modeled with wax. Broad leaves were made from vacu-formed acetate sheet. 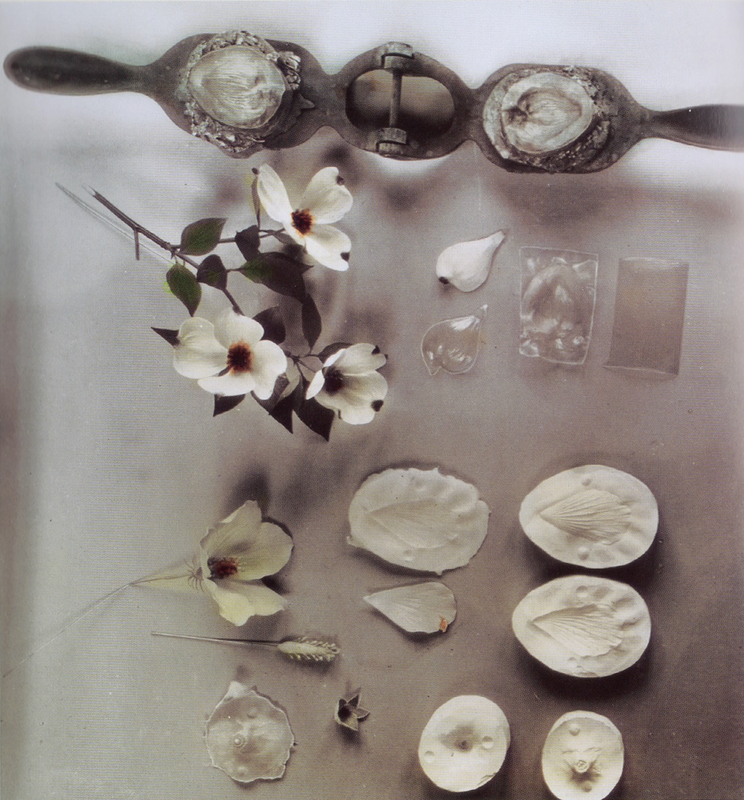 Snow was created using combinations of plaster, sand, cotton batting and plastics. A limited number of real botanical specimens, such as grasses, evergreen branches, mosses, and leaves for ground litter, were collected, sometimes chemically treated with preservatives, and then installed. The mammal specimens were mounted in the museum following procedures developed by Carl Akeley in earlier decades, details of which are also discussed in Windows on Nature (Quinn, 2006). 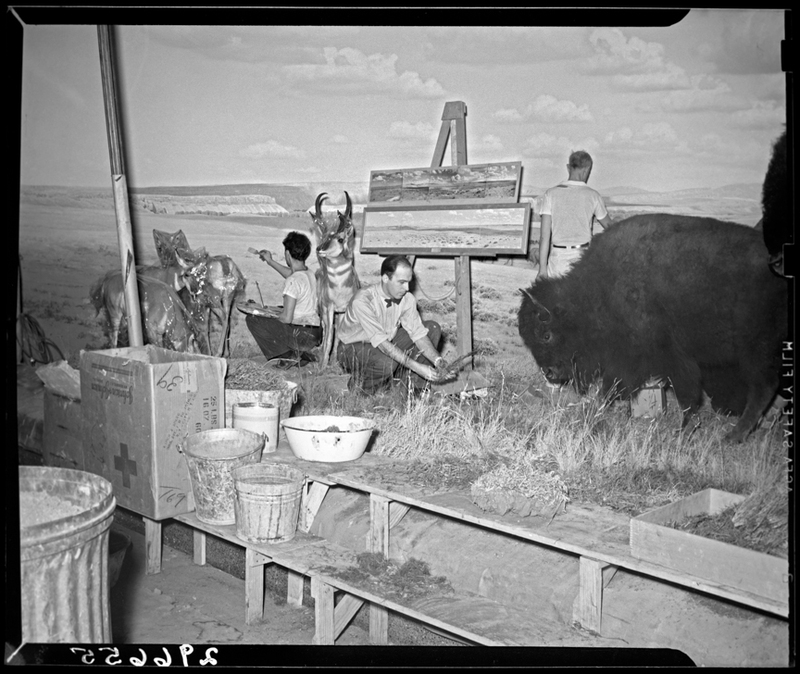 The larger taxidermy specimens are mounted into the diorama floors, and thus cannot be removed for treatment. Many of the smaller specimens, however, are able to be removed. A large glass panel serves as the front face of the diorama, and is angled slightly to prevent reflection. A separated light box with fixtures for interior illumination is located above the enclosure. The original lighting scheme from the early 1940’s is known to have included large theatrical lights. Lighting revisions shortly thereafter, in the 1950s, resulted in a combination of fluorescent and incandescent fixtures. This scenario caused a number of unsurprising problems. Temperature inside the dioramas was elevated, often reaching the high 80’s °F. The relative humidity was low, with daily and seasonal fluctuations. Light levels were far higher than is recommended for museum collections and, until recently, lamps were not screened for ultraviolet emissions. These conditions resulted in deterioration, desiccation, and fading of most exhibit materials. 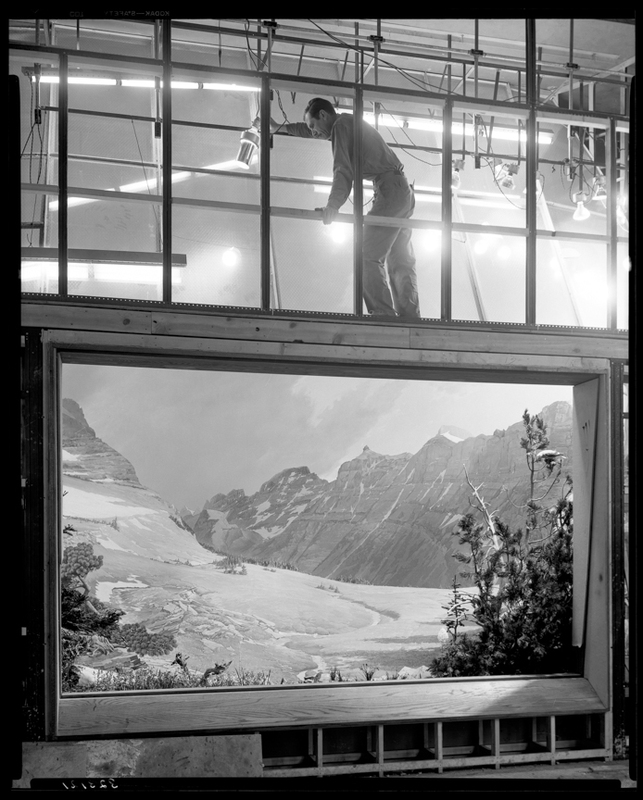 Lighting technician Arthur Scharf adjust lights in the Timberline group diorama in the Hall of North American Forests, 1954. Informed by a 2003 conservation survey of the dioramas in the Museum’s Akeley Hall of African Mammals undertaken at the museum, testing had demonstrated that it was possible to reduce heat and light levels inside the dioramas while maintaining the desired visual appearance through the use of energy-efficient lamps. In 2010, as a result of the American Museum’s participation in a citywide effort to decrease energy consumption, funding was provided to replace the diorama lights with more energy-efficient fixtures. The goal of the re-lamping project was to achieve a 50% reduction in electric power consumption. Retrofit fixtures were researched and chosen by an outside lighting design firm to reproduce the visual appearance of the original design, using a combination of energy efficient fluorescent bulbs for indirect lighting and LED flood lights and metal halide spot fixtures as accent lights. All new lighting fixtures are filtered for UV emissions. The re-lamping project provided the impetus for a broader renovation of the Hall of North American Mammals. The renovation team began to explore possible methods of restoring naturalistic color to specimens that had become faded and desiccated in the previous damaging lighting environment in hopes of extending their exhibit life. Just as the dioramas’ fabrication was necessarily achieved through collaboration, this conservation effort also involved a diverse team of participants, including curators, objects and paintings conservators, exhibition department staff, outside scientists, and a master taxidermist. The next post will examine the many factors that influenced how we decided what recoloring materials to research and test. I’m following this project with high hopes of new techniques being developed for museum collections, recoloring isn’t a new process but one I believe will evolve into the first consideration given when considering chemical dyes, and tints. Historically specimens (mounts), were replaced with new capes and skins, but this isn’t possible on rare and endangered species, I believe the dye and tint process has a definite contribution, but in the end replacing capes and skins will be the best way for most of the dioramas. I was faced with this issue years back with the L.S.U. Museum of Natural History, with a small collection of expertly mounted mammals in dioramas and a large bird collection, unfortunately today due to a lack of funds and complacency these beautiful works of art are slowly deteriorating, I look forward to the results of the study.